Are the highly-hyped “ultrabooks” worth it? That was the question swirling many minds heading into the desert surrounding the Consumer Electronics Show. After viewing several models, this technology will be among the top five newsmakers of this year’s CES. The biggest names in the business, from Samsung and Toshiba, to Acer and Hewlett-Packard were showcasing their renditions of ultrabooks: sleek, shiny, light and packed with impressive specs. After logging 33,000 hours to develop the Samsung Series 9 Notebooks (ultrabooks), the Korean electronics maker has packed them with a lot of punch, such as “MaxScreen” technology. Similar to their HDTVs minimizing the bezel around the screen, MaxScreen offers more real estate on this 15″ premium ultrabook. 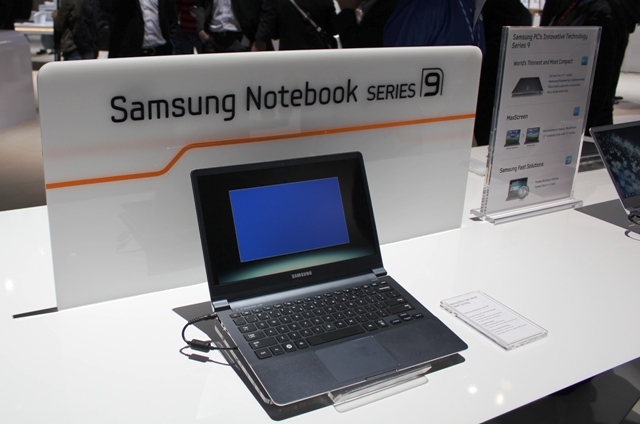 Aside from being the world’s thinnest and most compact 15″ ultrabook, it weighs-in at just 3.5 lbs. The 13″ Series 9 ultrabook is weighs a mere 2.5 lbs. Under the hood, the Series 9 ultrabooks offer an Intel Core i5 Processor 2537M, Intel HD Graphics 300 chip, 4GB of memory and a hard drive capacity of 128GB SSD. Over at Toshiba’s booth, a big draw is their Satellite Ultrabook with Ivy Bridge processor. This compact ultrabook measures 14″ and in addition to multiple USB ports, will feature a HDMI port and chiclet-style keyboard. Both ultrabooks are expected to launch later this year. Samsung has also stirred noise by revealing its new Samsung Galaxy Note. The Galaxy Note is a whopping 5.3” Gingerbread (Android 2.3 OS) smartphone that works as a mini tablet. It comes equipped with a stylus pen, dubbed the “S Pen.” There are plans in the U.S. include 4G LTE connections via major carriers. Launch date is TBA, but will arrive in Canada. So phones are getting larger. Tablets on the other hand are shrinking. Toshiba, for example, is showcasing its newest tablet prototypes in a variety of sizes starting at 5.1”, progressing to 7.7” and up to 13.3”. Toshiba’s 5.1” tablet was unique not only by size, but also the fact it uses a 21:9 aspect ratio screen. The 7.7” tablet is equipped with a beautiful AMOLED screen. 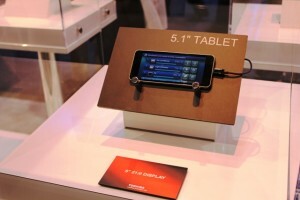 There was a 10.1” tablet on display labeled as the world’s thinnest tablet 10” tablet. Finally, the largest tablet on display at Toshiba’s booth measuring 13.3” needs two hands to handle it and takes viewing media or playing Angry Birds to the next level. Aside from the details above, we’re left guessing when the Excite X10 will release at Canada. Future Shop carried the Toshiba Thrive at launch so you can expect announcements for the Excite X10 to be announced this year. Should You Feel Bad About Blocking Online Ads? Why aren't there more women in the tech startup scene? Public Relations and marketing-communications professional living and working in beautiful British Columbia. Communications Manager and blogger for Future Shop, Canada's largest retailer and etailer of consumer electronics. Director of Communications for Canada's largest TEDx event, TEDxVancouver.